The Guymon Lady Tigers wouldn’t go away. 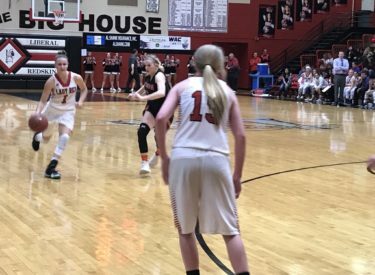 Facing a Liberal team who is ranked third in 5A and beat Guymon 49-25 on December 5, the Lady Redskins had to hold on for dear life to beat the Lady Tigers 48-44 Tuesday night in the Big House. The game was tied 9-9 after one and LHS led 21-19 at the half. Guymon led 31-28 late in the third before LHS rallied. Ali Lucero hit a three and Katie Horyna was fouled at the end of the third quarter to give the Lady Red at 35-32 lead after three. Liberal led 39-2 and 44-36 before Guymon’s Alex Bishop hit a couple of three’s and brought Guymon to within two at 44-42 with 3:35 to play. Whitney Hay hit a key fourth quarter three pointer and a couple of free throws to help Liberal to the season sweep against Guymon for a second consecutive season. Guymon made just 9-18 free throws which hurt their upset bid. Machia Mullens had 12 and Ali Lucero had 10 points and seven assists. Whitney Hay had eight points and six rebounds. Aubrey Warden had eight. Guymon’s Alexis Bishop scored 12 and was injured late in the game. Johanna Quintero scored 11 and Danica Portillo had 10. Liberal is 14-1 and Guymon is 8-12. Liberal hosts Hays for homecoming Friday night at 6 on 1270 and kscbnews.net. Redskin Pre-game begins at 5:45. Guymon hosts Heritage Hall on Thursday. The Lady Redskins will be featured during the Southern Pioneer Electric Rowdy Crowd Show Thursday night at 5:30 at Billy’s on 1270 and kscbnews.net.